The house mouse is, unfortunately, the species of mouse everyone thinks of when they hear the word mouse. It is because they live in close association with humans that they are one of the most familiar small mammals to humans. House mice are similar in size solid grayish-brown color above and below. Their tail is also scaly like a Norway rat and not covered with fur like the deer mouse. House mice are occasionally found in fields, but usually in buildings. They will eat most anything and breed year round having as many as a dozen litters a year of 5-8 young each. A family of six mice can multiply into a family of 60 in 3 months. Young are able to breed at a age of six weeks. The lifespan of a mouse is approximately one year. Because mice chooses to live near humans, it is considered a pest. This species is the one sought after in trapping and poisoning efforts by humans. This rat lives both with man, and in the open where vegetation is tall. It makes its home principally in a basement or a burrow under a sidewalk or outbuilding. It appears to be most common around feed stores, chicken houses and garbage dumps. APPEARANCE: Black or brown, can be 13 to 18 inches long, with long tail, large ears and eyes, pointed nose and weigh 5-9 ounces. Body is smaller and sleeker than norway rat's. Fur is smooth. NESTING REQUIREMENTS: Roof rats nest outside in trees, woodpiles and debris and in dese vegetation. Inside, roof rats prefer to nest in the upper levels of a building in the attic and ceiling. MEDICAL IMPORTANCE: Rats can spread disease. Sometimes they transmit directly by contaminating food with their urine or feces or by biting people. Indirectly, they transmit by infecting as when fleas bite a disease-infected rat. then the infected flea bites a person or other animal. 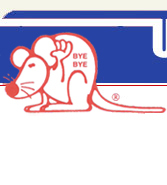 HOW DO ROOF RATS ENTER HOMES: They enter homes, sheds, garages and other structures through opening larger than a nickel. Looking for places safe from predators and good nesting. They follow pipes down from the attic, gnaw through drywall, to access structures. They may chew through wood, plastic, aluminum siding, sheet rock and soft metals to gain access to interiors. Attics provide a safe refuge, a nesting place for their young and routes into the home below.